This is old version slither.io 1.4.2 apk for Android, you can install it if you want to downgrade or install old app. It is top Action apps from Thorntree Studios. The player can easily navigate the snake. Since the navigation is easy to control, the player will be able to consume other player’s snake effortlessly. Despite the fact that you are able to play with other player over the globe, this game does not involve leaderboard. 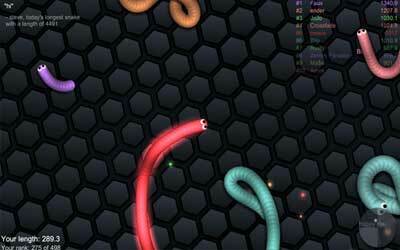 The players occupy the same space are listed in the screen in different colors corresponding to the color of the snake. In-app purchases are implemented in this game. In addition, it is recommended for you who need game to kill your time. Although this exciting and addicting game is simple to navigate, you need to avoid hitting other snake body with your head. If this happens, your snake is going to be exploded and other snake can consume your remains. Create a circle and trap other snake inside, so that they will hit your snake body and explode. How big your snake can grow? Find out yourself by playing Slither.io for Android from your smartphone. You can swerve in front of a much larger snake to defeat them – no matter what size you are!